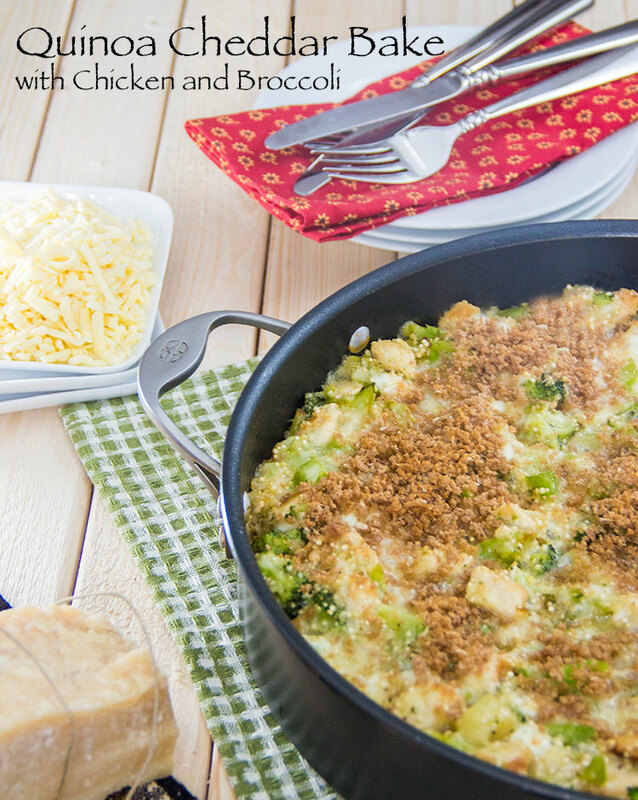 I think nearly every American is well acquainted with this dish: the Baked Chicken Broccoli and Rice Casserole. Featuring plenty of white rice and plenty of cheddar cheese. And topped with a can of Campbell’s Cream of Broccoli Soup. …So lately I started thinking: the chicken broccoli and rice casserole is the perfect target for a healthy, 21st century upgrade. 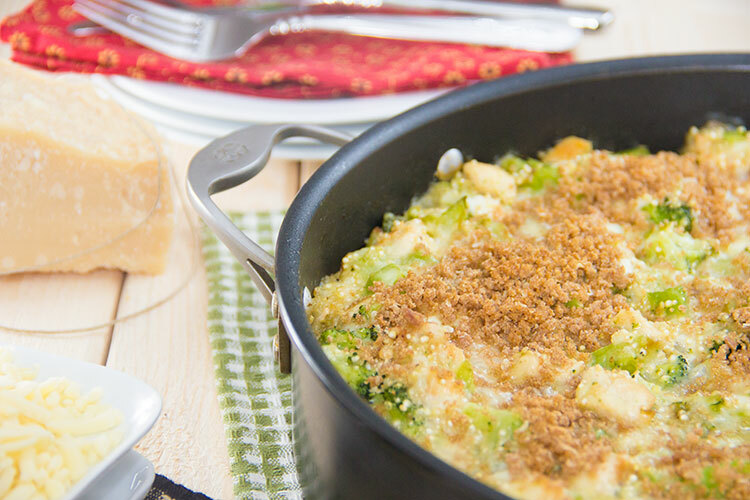 My version, a quinoa cheddar bake with chicken and broccoli, has a few tweaks to make it healthier and taste so much better. At the same time, this modern, updated version is still really quick and convenient. I crave this recipe often because it just tastes so rich and flavorful. At the same time, it features lots of fresh, healthy, whole ingredients like quinoa, lean chicken breasts, and broccoli. Start to finish, this is an easy dish that takes only 30 minutes to throw together. 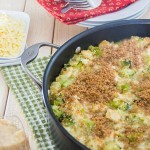 So I really love this casserole for hectic weeknights. End result: a tasty plate of rich, cheesy comfort food. This easy casserole is full of healthy ingredients. But all the melted, gooey cheddar makes it a dish that could please a crowd. Bring two cups of water to a boil in a saucepan, and season with salt. Add the quinoa and reduce to a simmer. Cover and cook until the water is absorbed, about 10-12 minutes. The quinoa is cooked when the spiral germ becomes visible around the grains. In a large oven-safe skillet, heat 2 teaspoons of olive oil over medium-high heat. Add the cubed chicken and season with salt and pepper. Saute until the outsides are nicely browned, about 7 minutes. Add the thawed chopped broccoli and cook until the broccoli is lightly softened, about 2 minutes. Turn off the heat. Add the cooked quinoa, cottage cheese, and 2/3 cups grated cheddar. Stir until well combined. Season to taste with salt and pepper. Spread the remaining 1/3 cup grated cheddar over the top of the casserole. In a small bowl, combine the panko breadcrumbs, grated Parmesan, and one teaspoon of olive oil. Stir until breadcrumbs are well coated with oil. Spoon breadcrumb mixture all over the top of the casserole. Transfer the skillet to the oven and bake until breadcrumbs are lightly browned and cheese begins bubbling, about 10 minutes. Serve. Love how you lightened up this dish! Looks like some great comfort food! This is beautifully flavored and even healthy too! Gorgeous dish. 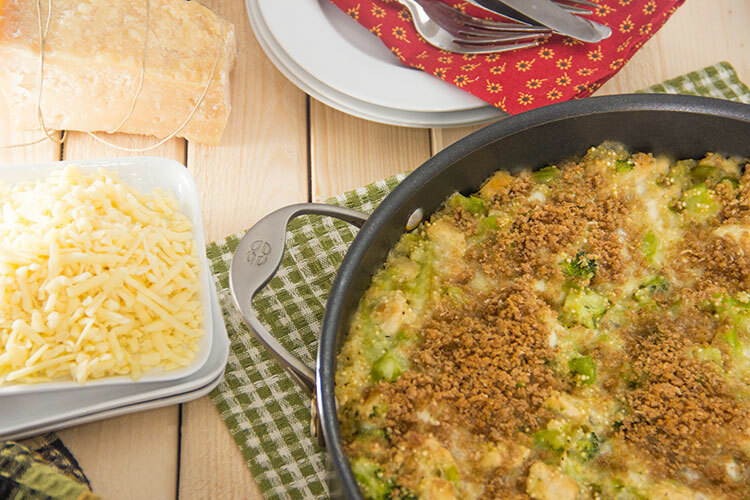 I just love anything with cheddar and broccoli, so this, for me …is a definite keeper recipe. Delicious! SUCH a smart, healthy upgrade! I think the boyfriend would even like this! What a delicious makeover! I can’t wait to try it with the Quinoa! I am wondering if you have any suggestions for a meat replacement in this? 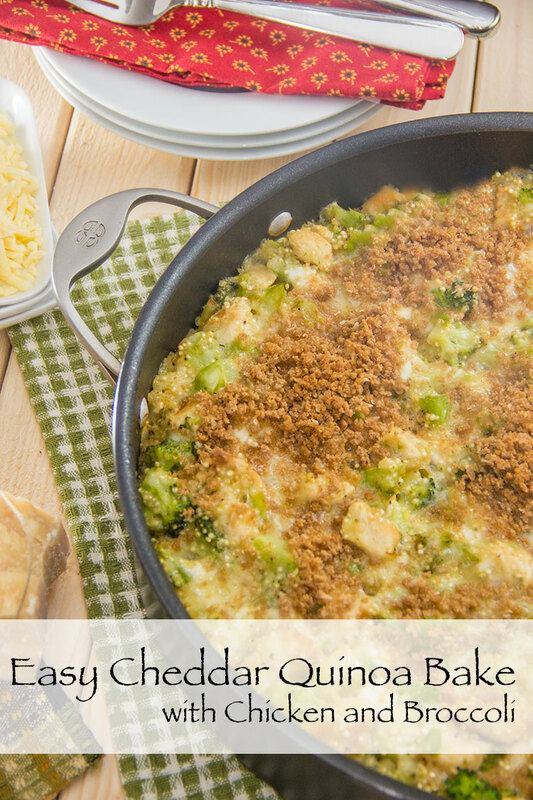 I love quinoa and cheese, and broccoli, so I will definitely try this one! I love your upgrades to a comfort classic. And broccoli is one of my favorite veggies, the perfect addition! Love your well achieved adaption of this classic! I love how you lightened these up and it has no condensed soup! Yummers! Wow .. this looks really good .. nice to have you back. Hope that everything is okay with you and your “boys”. By the way I can now get Panko over here .. every store suddenly has it, love it – this will I give a go after Easter. I wish you and the boys … a wonderful and spring-full Easter. We got new snow again today. Wired winter this year. I never had this growing up, and when I tried to make it in college I HATED it. I love your upgrade though! I’d probably like this a lot! I grew up eating lots and lots of Broccoli and rice casseroles with and without chicken. It was an old standby and usually made with cream of chicken soup. I love your version and especially the use of quinoa! I really need to try this. Thanks! I am SO sold on this dish. I eat quinoa on the regular, but I love the sounds of this comforting meal. Total bonus that it’s so quick to whip up – perfect for a weeknight! This looks delicious! I love an upgraded comfort food like this. Plus I love cheese and broccoli together. This was so delicious! I was skeptical about the cottage cheese, since I normally don’t like it. But I followed the recipe exactly, and my husband and I both enjoyed. Thanks so much! Just made this but added some lemon pepper (addiction) and cayenne for some kick. This is delicious!! Thanks for this combination. I added some Dijon mustard to low-fat sour cream and mayonnaise because I was out of cottage cheese. My family still loved it. YUM! I had to make some changes based on what I had on hand. I didn’t have any cottage cheese or panko bread crumbs. Instead I used some milk, cream cheese, and used regular store-bought bread crumbs. I didn’t measure the milk and cream cheese, but it turned out fine. I also sauteed half an onion and some garlic with the chicken and added some garlic powder, too. I feel it needed some more zing. Maybe more salt than what I put in. Someone’s idea of adding some dijon mustard would probably be good too. All in all, this is a good healthy recipe that will keep and play around with. I love using the quinoa instead of rice, and NO cream soup! This recipe is delicious!! We didn’t have cottage cheese on hand, so we used plain Greek yogurt. It was a fantastic, quick weeknight meal. Thank you! What great idea for quinoa…and so versatile, I can add any of my choice of vegetables to it! Thanks for the deliciousness! We’re having the Cider Glazed Salmon tonight…! Thanks so much for taking the time to send such a nice note 🙂 Your additions of fresh garlic and garlic powder sound so tasty too! I made this tonight. Didn’t have cheddar so used low fat mozzarella! This is simply delicious!! Even my picky adult son raved about it and went for seconds! The quinoa filled me up quickly so I was satisfied with a small portion! Everyone loved it! Thanks!!! Yay, so glad to hear this was a success for you 🙂 Thanks so much for your note!